When Caelan first starting sleeping in his crib at night, I’d nurse him while sitting in the rocking chair in his room. I’d always look up at this one spot on the wall expecting to see a clock there, but there wasn’t one, nor had there ever been a clock in that particular spot. 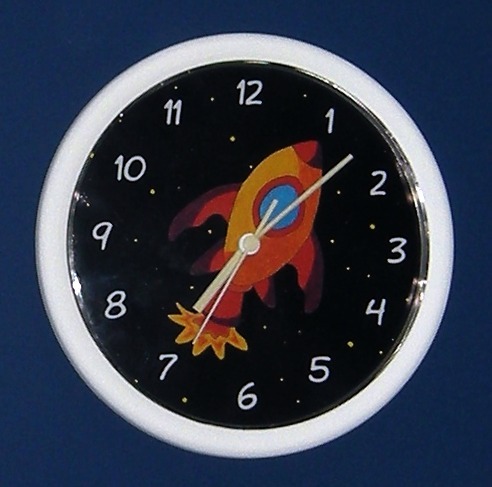 I looked around online for a clock that would fit into our theme in that room. 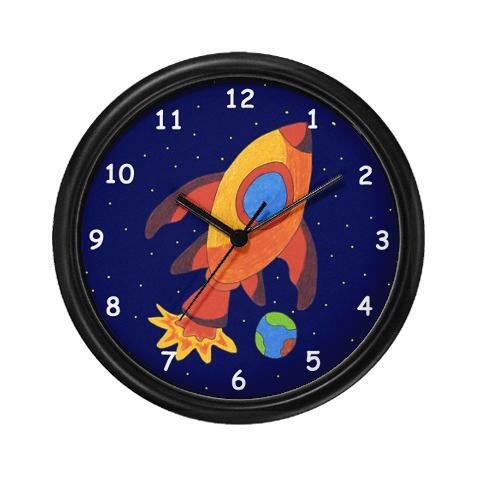 I was specifically looking for something with a rocket ship on it because though the bedding set we picked out for Caelan had rocket ships on it, we didn’t really incorporate those into the room and I wanted to. I found this clock at Cafe Press. I really liked it because the dark blue background would be a good match to the dark blue wall and of course I liked the rocket ship. I didn’t like the black outer rim, but I thought maybe I could paint it white. What I didn’t realize until I hung the clock on the wall was that the black hands on the dark blue background made it impossible to read unless you were standing within 2 feet, which sort of defeats the purpose of a wall clock. So now I started to think that in addition to painting the rim, I should also paint the hands. I knew the clock must come apart so I carefully tried to remove the clear face and the hands and luckily it worked out. I used white acrylic paint and a foam brush and painted the rim and hands with about 5-6 coats. I also went over the hands with about 5 coats of glow-in-the-dark paint that we had left over from painting the stars and moon on the walls. The hands did seem to glow once the paint had dried, but once I reassembled the clock, the hands don’t really glow anymore. Possibly the clear cover over the top interferes with the charging? Regardless of the glow-in-the-dark issue, this project worked out and now the clock is much easier to see! You are currently browsing the Decorate This blog archives for November, 2011.